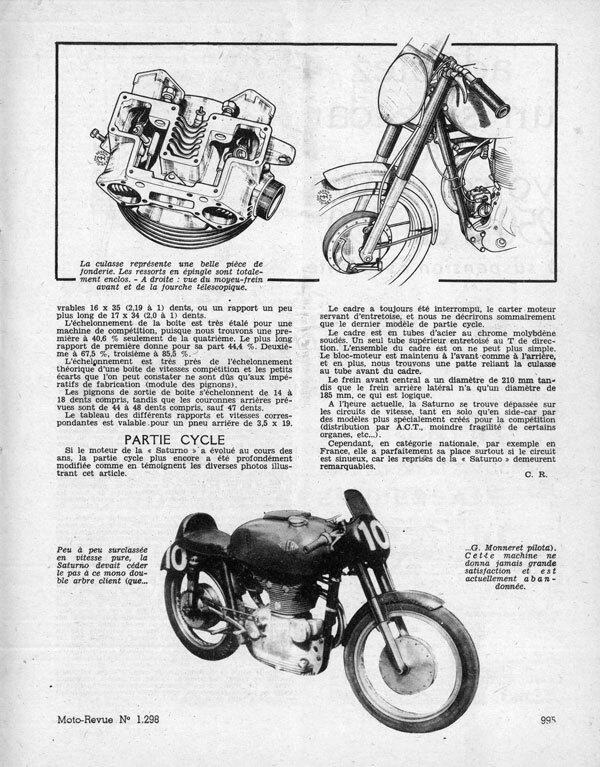 Translation by Lucien C. Ducret from French to English of Moto Revue magazinearticle “Racing Gilera Saturno” of July 14 1956 issue # 1298. 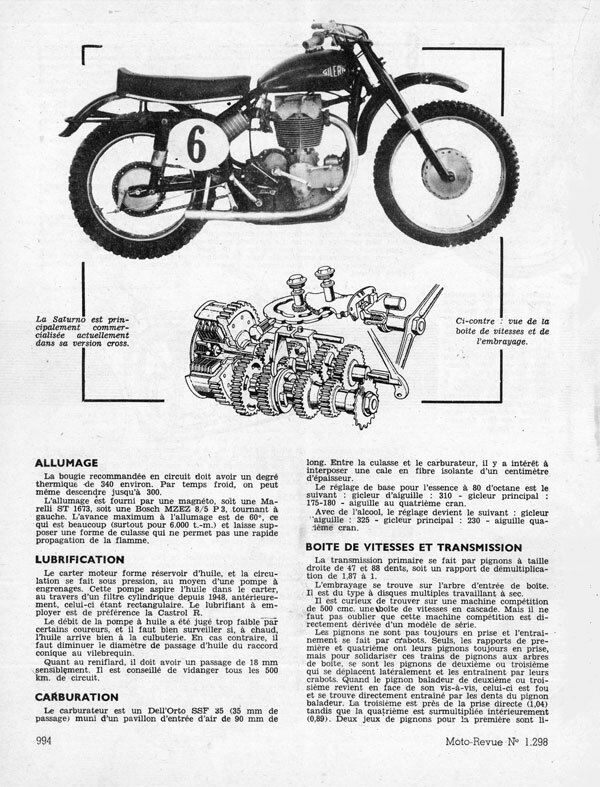 Some of the material used in this article was provided to Moto Revue in early 1956 by Lucien C. Ducret. The brand name Gilera is known among fans of motorized sports, but the famous brand from Arcore Italy is mostly known abroad because of it’s factory team participation in European racing circuits (with the first 4 cylinder bolted across the frame machines), rather than their export of street machines. There was a time up to 1951 where the privateers on the single cylinder Saturno used to compete successfully against the factory Norton, Guzzi etc. The factory built racing Saturno was raced in France by Jack Collot, Pierre & Georges Monneret, Georges Houef, Jean Murit in side-car and raced in Moto-Cross by Molinary and Melioli. The Saturno racing engine is a single cylinder unit construction with special pushrods. The bore is 84mm with a rather long stroke of 90mm, giving a 1.07 ratio. The displacement is 494 cc or roughly 30 cubic inch. The distribution is by rocker arms with aluminum pushrods of 8mm diameter. Cam follower arms are inserted between the racing cam and the pushrods. The top cover has a hump to give more clearance for the rocker arm which makes it easy to identify the racing type engine. Valve clearance is adjusted with a ball end set screw and nut on top, mating in a concave depression on top of the pushrod. The cylinder head is hemispheric and the two valves have a diameter of 42-44mm. This changed in 1952 to 46mm intake and 44mm exhaust, valve lift is 10mm. The valve angle between the valve stems is 70 degrees. The cylinder head carburetor intake passage is 35mm diameter at a 10° angle while the exhaust pipe internal diameter is 42mm enlarged to 46mm on the latest models. The racing cam diagram has a rather large overlap of 105°, intake valve opening BTDC 55°, intake valve closing ABDC 70°, exhaust valve opening, BBDC 82°exhaust valve closing ATDC 50°. The opening time of the intake valve is 305°, compression and power stroke is 208°, while the exhaust valve opening time is 312°. The 500cc single cylinder B.S.A. Gold Star engine cam diagram is actually very close to the above. The large unit-motor lower castings are made of magnesium while the cylinder is made of cast aluminum with a cast iron liner. The cylinder head is also cast aluminum. The cylinder and cylinder head have been updated with larger cooling fins throughout the years. The cylinder head assembly is held to the lower housings by five strong rods with differential threaded ends (worth noting, the famous prewar Gilera “Otto Bulloni” had eight rods). The cylinder head has enclosed valves with hair springs type. The rod big end uses a double row of rollers changed to single row on latest models while the crankshaft spins on three bearings. One roller bearing is located on the primary transmission side (near the flywheel of the crankshaft). A second ball bearing is on the end of the crankshaft next to the primary gear, (nested in the clutch and transmission cover). The third crankshaft ball bearing is next to the flywheel on the distribution side. Except for the crankshaft, most of the important mechanical elements of the motor can be readily removed without removing the engine from the frame. Parts such as the speed selector assembly, chain sprocket, gearbox, clutch, oil pump, primary transmission gear, cylinder head & cylinder. The recommended racing spark plug should have a thermal rating of 340, in cold weather it can be lowered to 300. The ignition is provided by a magneto, either a Marelli #ST1673 or a Bosch #MZEZ 8/5 P3 with CCW rotation. The maximum spark advance is 60° which is high, especially at 6000 rpm. This indicates a combustion chamber which does not have fast flame propagation. The lower motor castings are designed to be used as an oil reservoir. The oil circulation from the sump is under pressure using a twin gear oil pump. The racing engine does not use an oil filter. The preferred oil for racing is Castrol R.
The flow of the oil pump to cylinder head was found to be insufficient by some privateers; it is suggested to check that the oil reaches the rocker arm cavities. If not, the passage in the conical part bringing oil to the crankshaft can be reduced. The engine breather must have an internal diameter of 18 mm. It is recommended to change the oil every 500 km (300 miles) of track use. The carburetor is a Dell’Orto SSF-35M flange type with a 90mm long velocity stack. A 10 mm thick shim made of heat resistant phenolic/fiber material can be bolted between the cylinder head and the carburetor to keep it cooler. The carburetor set up for 80 octane gasoline is as follows: needle jet size 310, main jet size 175-180, needle set on the fourth notch. The primary drive uses straight cut gears of 47 & 88 teeth with a ratio of 1.87:1. The dry clutch with multiple discs is mounted on the end of the gearbox shaft, with the clutch basket attached to the 88 teeth primary gear transmission. It is unusual to find a 500cc competition motorcycle gearbox with gears aligned with a progressive number of teeth. One must understand that the gearbox design is derived from the production motorcycle. The gears are always in full or partial mesh, the power is transmitted by dogs. Only the fourth and first gears are always in full mesh. The second and third gear train on the gearbox shaft slides sequentially by means of a slotted cam disc. This moves the forks fitting over the grooved sliding gears, bringing them with the slotted cam disc into position. The third gear speed ratio is close to direct engagement 1.04 while the fourth gear speed is an overdrive with a .89 ratio. The first gear 16/35 teeth standard ratio of 2.19 can be interchanged depending of the demand of the circuit with 17/34 gears or a ratio of 2. The first gear is only 40.6% of the fourth gear, the 17/34 gears give 44.4%. Second gear 67.5%. Third gear 85.5%. The ratios are very close to a theoretical racing gearbox. The chain sprockets on the motor are available from 14 to18 teeth, and the rear wheel sprockets from 44 to 48 teeth except 47 teeth. The speed table is based on a 3.5 x 19 tire size. As the Saturno motor evolved through the years, the frame changed even more (as shown with the pictures and drawings). The frame is formed from chrome molybdenum steel tubing; the lower portion of the frame is open to bolt on the stressed member motor. The cylinder head is connected to the upper front portion of the frame with double straps. The central hub front brake has a diameter of 210 mm, while the rear brake is 185 mm. Single cylinder competition motorcycles such as the Saturno Corsa Piuma are being over taken by multi cylinder machines on local and national circuits. However, the Saturno, with it’s gobs of torque on especially tortuous circuits is a machine to contend with. The Gilera Sanremo was named due its racing success in the hands of Carlo Bandirola on this especially winding San Remo circuit. Most competition motorcycles are modified every year, the Saturno was improved as well with the passing years. The first San Remo model is shown above to the last Telescopic Piuma model underneath. 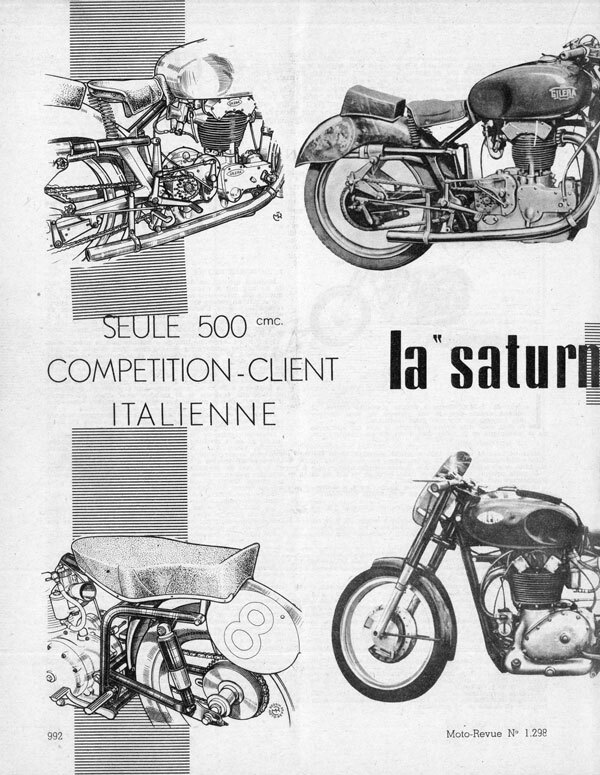 Little by little the Saturno was overtaken in pure top speed, Gilera built two new twin cams models, and due to many factors they did not perform well and were later abandoned. Of seven races entered G. Monneret managed the only victory of the twin cam “Bialbero” in May of 1953.